De Habitat is one of the residential development of Royal Mahanagar Developers, located in Bhubaneswar. It offers two phases and spacious and skilfully designed 2BHK and 3BHK apartments and villas. The project is well equipped with all the amenities to facilitate the needs of the residents. What is the location of De Habitat?The location of the project is Chandrasekharpur, Bhubaneswar. What apartment sizes are available in De Habitat? The project offers apartments sized between 1045.0 sqft and 1643.0 sqft. 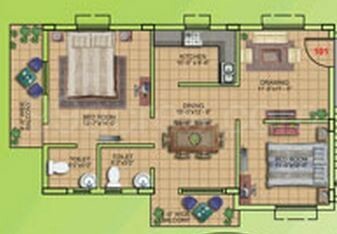 What is total area of 2 bhk in De Habitat? 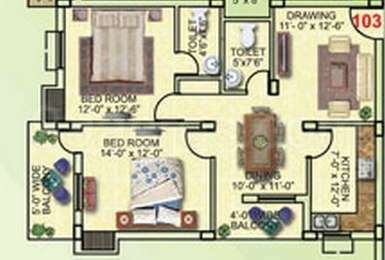 The area of 2BHK units in the project varies from 1045.0 sqft to 1230.0 sqft. Does De Habitat have badminton court? The project doesn't have a badminton court. Does De Habitat have gym? Yes the project has a gym. are there any flats left in this project? Hi Manisha, why don't you contact the builder directly by visiting his website?